Maestro of South Florida´s acclaimed Symphony of the Americas, Dr. James Brooks-Bruzzese, was born in Panama in a bilingual home---his mother born in Colombia and his late father a member of the United States Armed Forces. He received his doctorate in Opera Conducting and Musicology from Washington University in St. Louis. Maestro coached in a master class on the music of Bach under the baton of the great Pablo Casals. Additional studies were with eminent conductors Leonard Slatkin of St. Louis Symphony and the National Symphony Orchestra; Ignace Strassfogel of New York’s Metropolitan Opera and Richard Karp of Pittsburgh Opera. Their mentorship is evident in Maestro’s founding of the Augusta Opera with singers from the Metropolitan Opera, Chicago Opera and London´s Covent Garden, receiving critical acclaim from Pittsburgh Post and Opera News Magazine. His musicianship is acclaimed as “Dynamic…exciting…and remarkable controlled, but simultaneously free spirited”.. Applause highlighting his work with orchestras and festivals on six continents has marked Maestro an outstanding conductor of the US. He has appeared with the National Symphonies of: Central America & Caribbean: Costa Rica, Panama, Honduras, Guatemala, Mexico, Dominican Republic, Curacao, South America: Venezuela, Peru, Brazil, Rosario & Sante Fe Argentina, Uruguay Asia: Korea, Taiwan, Korea, Malaysia (acclaimed Mozart Festival) Africa: Natal Philharmonic, Johannesburg Symphony Europe: Russia, Bulgaria, Romania, Poland, Turkey, Greece, Switzerland, Austria, Valencia & Malaga Spain, Slovak Republic, Czech Republic & the Czech Virtuosi, Berlin Philharmonic, Hungarian Virtuosi, Budapest Chamber Orchestra, Hungarian Radio Orchestra, Istanbul State Symphony, Arpeggione Chamber Orchestra, the highly recorded Cappella Istropolitana of Vienna, Greek Hellenic Camerata, Rome Festival Orchestra, Costa Festival Orchestra of Italy. In 2005, Maestro was honored at Washington´s Kennedy Center with the Hispanic Heritage Foundation´s Award for the Arts in recognition of his lifelong work as a world-renowned conductor and his dedication to promoting classical music to youth around the world. Maestro received the Critics Choice Award at Brazil´s famed Villa Lobos Festival in Rio. 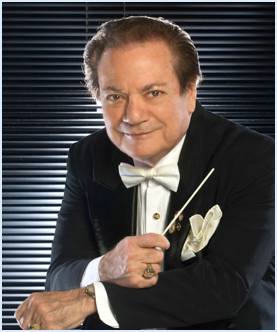 He has been recognized by heads of state and dignitaries all over the world - US President Ronald Reagan praised Maestro as an “Ambassador to Latin America for his exceptional musical talents and diplomatic skills.” He is also a proud recipient of the distinguished 2009 Amigos Award from Hispanic Unity of Florida.